Building Diplomacy, Not Just Walls: US Starts Work on New Mexico Embassy - Integration Through Media ....! 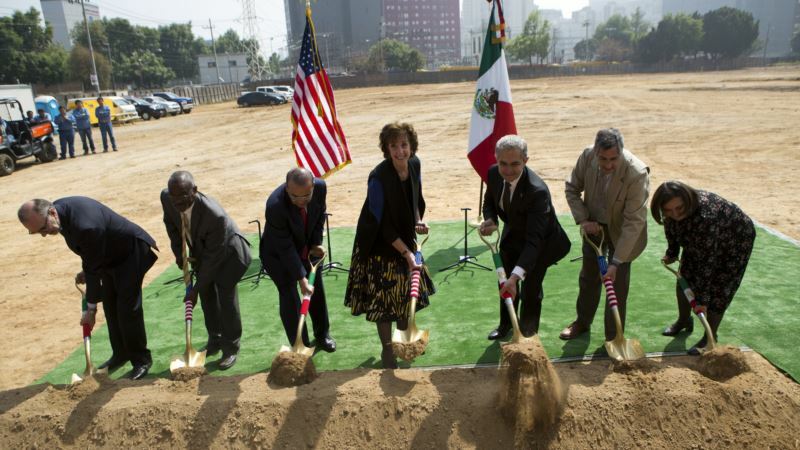 (VOA): The United States broke ground on a new $943 million embassy in Mexico City on Tuesday, a move hailed by officials from both countries as a win for diplomacy after months of tension over President Donald Trump's plan to build a tall border wall. Officials gathered for a ceremony to mark the start of construction for the sprawling embassy, which is nestled close to the headquarters of Mexico's richest man, Carlos Slim, and scheduled for completion in 2022. At the groundbreaking, U.S. Ambassador Roberta Jacobson underscored the importance of the bilateral relationship. "Mexico is one of the United States' closest and most valued partners," she said. Alabama's Caddell Construction Co. is handling construction. It was one of six firms that presented the U.S. Customs and Border Protection agency with a prototype for Trump's proposed border wall on the Mexican border. Trump's rhetoric and policies have strained relations between the two countries. Trump has used the contentious issue of whether to shield from deportation young immigrants known as "Dreamers," including hundreds of thousands of Mexicans, as a bargaining chip to get funding for the wall project. The influential Mexican newspaper Reforma incorrectly reported last year that the new embassy project had been put on hold indefinitely. Though the March story turned out be wrong, it was indicative of the tense atmosphere surrounding Trump's early months in office. Trump has threatened to pull out of the North American Free Trade Agreement, a lynchpin of Mexico's economy, if he cannot rework it to better benefit American workers and interests. The uncertainty around the future of the $1.2 trillion trade deal has rattled markets and spooked investors. At the ground-breaking ceremony, Slim said he had not seen investment affected. "Investment is continuing. Look at all this. There is no better sign," he told Reuters, pointing at the construction site. The work on the new diplomatic headquarters in Mexico City comes in the wake of Trump cancelling a trip to London to open a new embassy there. Trump said he did not want to endorse a deal agreed by the Obama administration to sell the old London embassy for "peanuts," even though the decision to move from Grosvenor Square in up-market Mayfair to the south bank of the Thames was agreed in 2008 under Republican President George W. Bush.